Kelvin McQueen is a member of the Education Contexts team. Kelvin received his BA DipEd and Honours degrees from Macquarie University in Sydney. After teaching for ten years in NSW rural and city public secondary schools, he taught the sociology of education and economic history at the University of Western Sydney for ten years, as well as HSIE curriculum studies for the Aboriginal Rural Education Program. Since 2005, he has taught with the Education Contexts Teaching and Research Group at the University of New England. 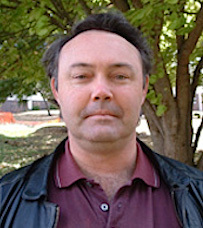 Kelvin's publications include Masterworks of Man and Nature (1992) for the United Nations, numerous book reviews covering educational, political and historical topics for journals such as Education, Education Links and Education Australia, and journal articles and conference papers on post-modernism, private schools, the Vinson Report, the Ramsey Review, police corruption, and the Macquarie Fields and Redfern riots. His Doctoral thesis, completed in 2004, is entitled The state aid struggle and the NSW Teachers Federation 1995–1999. McQueen, K. (2016). A brief survey of Marx and Engels' views on the environment. Australian Socialist, 22(3), pp. 13-14. McQueen, K. (2016). Terrorism and Marxism. Australian Socialist, 22(2), pp. 11-12. McQueen, K. (2016). The Films of Gillo Pontecorvo. Australian Socialist, 22(2), pp. 22-23. McQueen, K. (2016). Marx and Engels on Tax. Australian Socialist, 22(1), pp. 10-11. McQueen, K. (2015). Do you have false consciousness? Try this quick Marxist quiz. Australian Socialist, 21(3), pp. 13-15. McQueen, K. (2015). What is your malaise: exploitation, oppression, alienation, or all three? A brief Marxist suggestion. Australian Socialist, 21(2), pp. 14-17. McQueen, K. (2015). Film Reviews: Nazism analysed. Australian Socialist, 21(2), pp. 19-20. McQueen, K. (2015). Who are the unemployed? A brief Marxist interpretation. Australian Socialist, 21(1), pp. 2-9. McQueen, K. (2015). Film reviews: Labour movement instant classics. Australian Socialist, 21(1), pp. 17-18. McQueen, K. (2015). Discuss: If essays are dead, then where does that leave everything else? Australian Universities’ Review, 57(1), pp. 69-71. McQueen, K. (2014). Social class and Australian schooling. In I. Soliman (ed.) Interrogating common sense: Teaching for social justice (revised ed. ), Frenchs Forest, NSW: Pearson Education Australia, pp. 47-74. McQueen, K. (2013). Beyond bounds? The terrorist teachers of Lev Vygotsky. History of Education Review, 42(2), pp. 185-198. McQueen, K. (2010). An historical and political re-assessment of Lev Vygotsky’s legacy for teacher education. In W. Halloway & J. Maurer (eds) International Research in Teacher Education: Current Perspectives, Armidale: Kardoorair Press, pp. 33-43. McQueen, K. (2009). Social class and Australian schooling. In I. Soliman (ed.) Interrogating common sense: Teaching for social justice, Frenchs Forest, NSW: Pearson Education Australia, pp. 47-74. McQueen, K. (2007). Creating a teaching underclass: The Federal government, the NSW Teachers Federation and the contracting-out of the Adult Migrant English Service in New South Wales, Australia. In R. Markey (ed.) Trans Tasman Labour History: Comparative or Transnational? (Proceedings of the Trans Tasman Labour History Conference, AUT), Auckland, NZ: Centre for Work & Labour Market Studies and School of Social Sciences, Auckland University of Technology, pp. 43-50. McQueen, K. (2005). Quality for some: David Kemp’s double vision of school quality. In P. Christie (ed.) Questioning ‘Best Practice’ in education: Benefits and disadvantages, debates and dilemmas (Proceedings of the 33rd Annual Conference of the Australian and New Zealand Comparative and International Education Society), Armidale, NSW: Centre for Research on Education in Context, School of Education, University of New England [CD-ROM], pp. 129-139.